If you’re from New England, and specifically Boston, you know all about Boston Brown Bread – Pared with Boston baked beans and fresh cole slaw, it’s graced many a Saturday night supper throughout New England. The B&M company, not to be confused with the huge British food conglomerate, has been making baked beans and brown bread for over 150 years, and there’s a reason they’re still around doing just that . A lot of folks, even locals, think that B&M is a Massachusetts based enterprise, but it ain’t so. Way back in 1867, George Burnham, started a canning business, was then joined by Charles Morrill, and Burnham & Morrill was born. B&M has been a fixture in Portland, Maine at One Bean Pot Circle, ever since. Their rightfully famous beans are still slow cooked in brick ovens, and their brown bread is the one, as far as I’m concerned. Their cans are filled with batter and the bread is baked in the cans, and that’s just how you do it. In the 19th Century, Brown Bread was poverty food throughout the British Empire, although it eventually gained cache for the health benefits of the mixed flour used to make it. Brown Bread crossed the big pond, and became a staple for the colonists, then a sentimental favorite – Keep in kind, once upon a time, lobster was considered ‘poverty food,’ so there’s no stigma attached to liking brown bread. 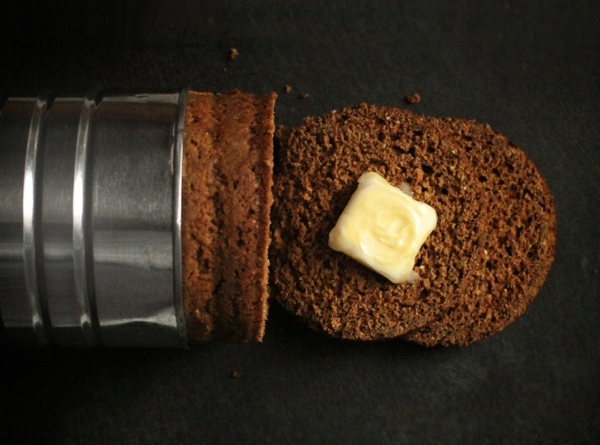 Boston Brown Bread is a great recipe for folks who are nervous about bread baking – It’s easy, fast, and almost foolproof – Brown Bread is steamed, rather than baked, and requires very little prep time. If you’ve never tried it, do. Served hot with fresh butter, ham, baked beans, and cole slaw, you got that legendary Saturday Night Suppah – And it’s great the next morning, too. NOTE: there are folks, (even B&M), who make this with raisins or currants within – I’m not one of them, but if you are, you can add a quarter cup to this recipe. there are also purists who pull eschew the addition of flavorings such as vanilla, allspice, and orange zest – I’m not one of those, either. Rinse and dry two 28 Ounce metal cans with one end of each cut off. Move a rack to the bottom third of the oven and heat the oven to 325° F.
Choose an oven safe pot or dish deep enough so that you can fill it with water to about halfway up the sides of the cans. Boil enough water on the stove top to fill that pot or dish. Lightly coat the insides of the cans with vegetable oil. In a mixing bowl, combine wheat flour, rye flour, cornmeal, baking soda, baking powder, allspice, and salt. Add the molasses, milk, vanilla and zest to the dry ingredients and thoroughly combine. 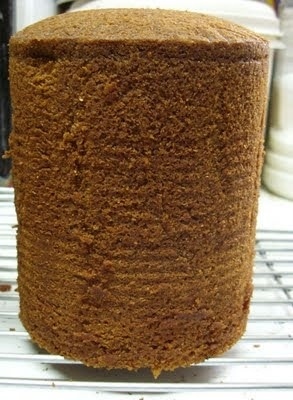 Divide the batter evenly between the prepared cans. 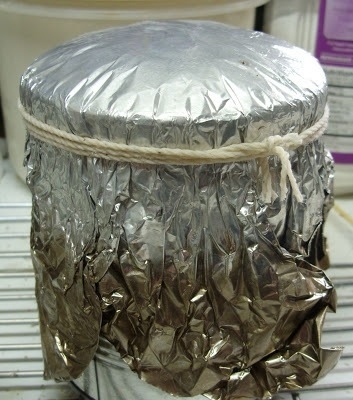 Cover the top of each can with a double thickness of aluminum foil and tie securely with kitchen string. Place the cans in your deep pan and slide that into the preheated oven. Carefully fill the pan with boiling water to about halfway up the sides of the cans. Bake for 70 to 75 minutes. At seventy minutes, remove the foil tops. 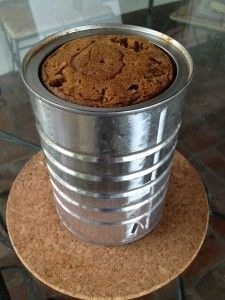 When the edges of the bread begin to pull away from the sides of the cans, you’re there. Remove the cans from the oven, place on a wire rack to cool for 1 hour before sliding the bread out of the cans. 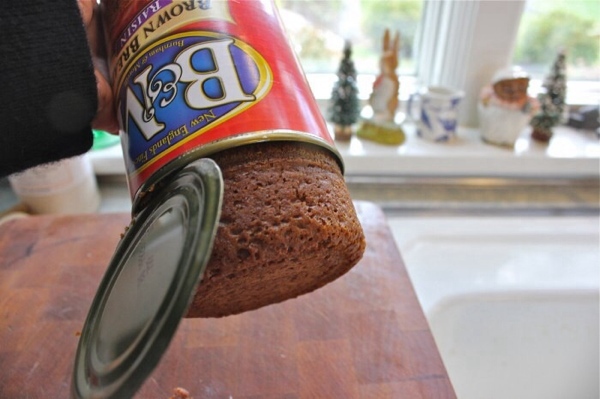 If the bread is a bit sticky, a thin bladed knife run around the can will free it up. So, a few days ago, alert blog follower and old friend Jeff Jaquish sent me a PM asking about a good Irish Soda Bread recipe. I was at work at the time, so I dove into my online files, found the first one titled Irish Soda Bread, and sent that off to him, and I posted it here, too. Then, this morning, with something nagging at my noggin, I dove back into my recipes and found much more thoughts and details in a second, unpublished file. I’ve got ahead and combined those here. The first recipe is my version with far more in it, frankly, than a truly classic recipe for this stuff, so I wanted to include a good base model too. Somehow, I’d completely forgotten about baking to a higher temp in a Dutch oven, and that’s a crime – I’ve corrected that here, so JJ, here ya go again. Irish Soda Bread, a Simple slice of heaven. Back in the early 1800s, Ireland was poor as poor can be, so stretching food wisely was a necessity. Soda bread, comprised of flour, buttermilk, baking soda, and salt, was perfect answer to the problem, especially when the potato famine hit, mid-Century. And by the way, yes, for genuine, old school Soda Bread, that’s all that needs to be in there – Raisins, nuts, sweeteners, and whatnot are purely American affectations, truth be told. Early commercial bakers discovered that bicarbonate of soda, (AKA baking soda), when mixed with hydrochloride acid, (Yes, Virginia, they really did that…), made for prodigious production of carbon dioxide – Lo and behold, they got bread much faster than they did by waiting around for yeast, (which wasn’t all that great back then), to do its thing. Fortunately, home bakers were far more sensible, and got their acid from buttermilk – Much more benign, much less dangerous, and tastier to boot. Those early cottage bakers, (AKA, Mom), would bake soda bread in a covered dish or skillet, a local version of a Dutch oven. They’d snuggle that dish right into the hearth, with some coals on top and some beneath, just as we do when camping these days. The results were and are a truly delightful bread, and it’s super easy to make. As with all things house made, ingredient quality and freshness count a lot. You’ll want the freshest All Purpose Flour you can find, and yes, It needs to be AP Flour – the relatively low protein content therein means gluten formation remains relatively low, and that yields a nice, chewy bread that won’t get too tough. Likewise. Check your baking powder before you start – As we’ve discussed here before, that stuff does have an expiration date, so make sure you’re working with fresh powder. Finally, get your buttermilk as fresh and local as you can. Now, for process, consider and abide by the following – This is a recipe you want to finish mixing and get straight into a hot oven. Unlike yeast, baking soda does its thing in a rapid and fairly short lived manner – Think about mixing Coca Cola and Mentos, and you get the idea. As soon as you pour in that buttermilk, the second hand on the ol’ stopwatch is in motion. Finally, you’ll see a lot of advice on kneading Soda Bread. I initially advocated around a 3 minute knead, and that’s OK, believe me, but there is wide variance available to you, depending on what you like. If you prefer things a bit more rustic, you can add enough additional buttermilk such that you’ll end up with a dough that is too sticky to knead, but too stiff to pour – that’ll be perfect – Put that in your Dutch oven and let ‘er rip. If you like a thinner, crunchier crust and a bit smoother crumb, keep the buttermilk percentage as shown and knead for a few minutes. What I love about this stuff is the fact that it has a crumb and texture that, to me, is quite reminiscent of good sourdough. The beauty is that you can have this out of the oven and ready to eat in under an hour, all told, while good sourdough is dang near an all day adventure. Give them both a try and let me know what you think. The sheet pan, lower temp version derives, for my mind anyway, a bit of a chewier crust, because it doesn’t take advantage of the steam factor baking in a Dutch oven will impart. Preheat oven to 350° F and place a rack in the middle position. Make sure your oven is all the way to temp by the time your ready to slide the dough in there. In a large, non-reactive mixing bowl, combine all dry ingredients and blend thoroughly. Add avocado oil, 1 cup of buttermilk, agave or honey, and the egg to the dry mix. Combine thoroughly with a kitchen spoon. Turn the dough out onto a lightly floured surface and knead for up to 2-3 minutes. You can stop when everything is well incorporated, or go on if you like things a bit more refined. Form the dough into a round, and place it on a baking sheet – A silicone sheet covering the metal is never a bad idea. In a sauce pan over medium low heat, melt the butter. In a small non-reactive mixing bowl, combine melted butter and remaining ¼ cup of buttermilk. Use a pastry brush to coat the outside of the loaf with this mixture. Bake at 375 for 30 minutes, then test the loaf with a toothpick stuck into the middle – Its should draw out cleanly. Depending on your oven, you may need to bake for as long as 45 minutes, but make sure you test at 30 minutes, and then every 5 minutes thereafter. Remove from oven and transfer to a wire rack to cool. Allow to cool completely before cutting, (30 to 60 minutes). NOTE: This recipe works great in a Dutch oven at 450° F for 40-45 minutes, too! Preheat oven to 450° F and set a rack in the middle slot. Make sure your oven is fully up to heat before you slide the bread in to bake! To help avoid sticking, line the bottom of a Dutch oven with parchment paper. We use a 10” oven, by the way, so that’s what this recipe is scaled for. Do the parchment thing even if your oven is well seasoned, because this stuff will stick. In a large, non-reactive mixing bowl, combine the dry ingredients and whisk to incorporate fully. Add the buttermilk and use a spatula to incorporate. When the dough just comes together, you can stop mixing if you like. Again, you can add more buttermilk here to get that too sticky to handle, but too hefty to pour consistency if needed. If you like your crust a bit thinner, continue to mix for another minute or so. Use the spatula to transfer the dough to your lined Dutch oven, and then to form a basic round loaf shape. Use a sharp paring knife to score the top of the loaf – You can do quarters, or straight lines, whatever you like. Bake covered for 45 minutes, then remove from oven and carefully transfer the loaf to a wire rack to cool. Allow the bread to cool thoroughly before you cut it – It’ll need that time, believe me – Anywhere from a half hour to an hour or more. I’ve said it before and I’ll say it again – Recipes aren’t really meant to be repeated exactly, time and time again – Even when you’re the one who wrote them. They’re a springboard to further exploration, and nothing more. A guitar making parable comes to mind – I’ve seen a bunch of builders, including me, make ‘identical’ guitars, from the same wood, built to the same specs, as close to each other as we can make them, and ya know what? They never sound, feel, or play the same. Same goes for recipes and cooking – For something iconic like cornbread, for instance. Let us pause to consider from whence this stuff came. Cornbread is largely seen as a southern culinary thing, but its roots go far beyond those boundaries. Our modern versions harken back in the 1600’s, when European interlopers adapted some bread making techniques to the new cereal the natives had introduced them to, (and had been cultivating, starting down in Mexico, for something around 10,000 years). Nowadays there are regional variances in style, and it’s interesting that those are almost diametrically opposed to what we see with biscuits – The farther south you go, the cornbread gets more rustic and less cakey, often with little or no added sugar and very little flour, (in fact, sometimes none at all). Meanwhile, while up north and out west, while not exactly flaky, you find a sweeter, more floury version. White cornmeal, closely akin to masa, is more popular in the south, yellow up north. Those southern differences may have to do with the prevalence of Mexican regional cooking, and the proximity to the origin point of the cereal itself, while up north, European influences speak loudest. That jibes with my personal experience as well – Growing up in Massachusetts, I remember cornbread as overly sweet and therefore, not much to my liking. When M and I moved to Texas, I found what I was looking for – Something that’s a bit more savory, and highlights the natural sweetness of corn without adding sugar or other sweeteners to the mix. In any event, cornbread isn’t something we make super often, so when we do, it can fairly be considered a treat. In that light, one should consider what it is you most want out of the stuff. For me, that means as moist as I can get it, while still being firm and grainy with genuine cornmeal flavor. For a good few years now, I’d landed on a cheddar version that we like a lot. I’ve taken to soaking the corn meal in milk or cream as a critical step, and in fact, doing that does make notably moister bread. Grinding my own cornmeal fresh, from local, organic corn was even better. Then, as fate would have it, a measuring malfunction lead to a new twist, or at least, new to me – I’d put too much cornmeal in the mix. Once I realized it, I balanced everything back out, but found I was out of the heavy cream I’d used for the dairy, so I thought – what the hell, why not throw in some sour cream? The second part of this tiny epiphany had to do with the chosen fat for the batch. I’ve used, and advocated here, leaf lard and/or butter, but all of a sudden, I thought about biscuits, and realized that what has really made my current version sing is avocado oil. If you haven’t tried that yet, it’s not really avocado-y in taste at all, just very subtle and buttery – Perfect for cornbread. Since I’d putzed around so long, I didn’t bother with the dairy rest for the cornmeal, (and it turns out that, with this version, I didn’t need it.) And as fate would have it, what resulted was what M happily anointed as ‘far and away, the best cornbread you’ve every made’ – High praise, that, believe you me. So I made a second batch, to make sure the recipe worked, then made one the old way, for comparison. What that does is give y’all a couple of options. In the picture below, the old recipe is the batch to the left, the new one to the right. First off, I assure you, both are fully cooked, and neither has had anything done to it other than being sliced. You can see how dense, moist, and almost muffinish the new recipe is, while the old one is lighter and airier. I like them both a lot, but M was right – The new stuff is heavenly. Pour cornmeal into a bowl and add the milk; mix well and allow to sit for 15 minutes. Mix remaining dry ingredients, (Including the cheese), in a large bowl. Melt shortening, then combine all ingredients and mix by hand to a nice, even batter consistency. Place the pan(s) you’ll do the bread in into a 400 F oven, with a small dot of shortening in each pan, (Or a tablespoon full if using a single pan). When the shortening is melted and sizzling, remove the pan, pour in the batter and return to the oven. Preheat oven to 400° F and set a rack in the middle position, with the pan your going to bake in thereupon. Add the cheese, egg, dairy, and oil, and whisk into a uniform batter. Carefully remove the hot baking pan and rub a little avocado oil around the inside, without burning yourself. Pour the batter into the baking pan and return it to the hot oven. I love Thanksgiving, and yeah, that’s because of the meal, and family, and warmth on what is often a cold, blustery day here in the Great Pacific Northwet. And I truly love turkey, so it’s weird that I have to remind myself to cook one more than once a year. Now, all that said, there’s a truth to that holiday repast that needs to be admitted and embraced – Thanksgiving dinners are really all about the sides and the desserts. Think about it – What would turkey be without spuds, stuffing, great veggies, cranberry sauce, and gravy? The answer is, boring to no end. So, last week we covered the bird, this week, it’s all about the other good stuff – Thanksgiving sides & sweets. When it comes to deciding what to put on the table for the Big To Do, I feel strongly that the answer should be, all of it. Don’t allow yourself to be limited by what you like – This is a meal made for sharing, for enjoying favorite dishes, and trying new ones, so make sure you allow that to happen. Ready? First off, spuds, of course, and since this is a meal designed for pulling out all the stops, why not offer two, or even three different versions? Here’s the drill for roasted root veggies, perfect mashed spuds, and incredibly decadent twice baked potatoes. First off, something fairly healthy, given that such a perverse wish might conceivably pierce the patina of excess that defines thanksgiving dinner. A blend of roasted root veggies is, relatively speaking, just that, (especially when compared to the two recipes that follow). Check out your local market and see what’s there. You’ll certainly find carrots and spuds, and probably parsnips, turnips, beets, and rutabaga too – They’re all common winter root veggies. Rinse off, and trim ends from all veggies. Cut root veggies into rough chunks about 1” in size – Equality makes for even cooking. Mince the garlic. Put everything into a large mixing bowl, and toss to evenly coat the veggies with oil, salt, and grains of paradise. Roast at 350° F for about an hour, until veggies are fork tender. Naturally, ya just gotta do mashed potatoes, too. Yes, ya gotta – it’s non-negotiable. For these, choose a high starch, non waxy spud like a Russet or Yukon. Doing so will give you dependably fluffy and smooth mashed spuds, (the waxy white or red varieties just never really get creamy, truth be told). The russets and Yukon’s are also more amenable to taking on necessary adjuncts, like butter and cream. Plan on 1 Yukon or 1/2 Russet per person, plus a few more portions for seconds and leftovers. Add spuds and bring to a boil, then cover the pot, reduce temperature to maintain a low simmer, and cook until the spuds are fork tender, about 20-30 minutes. Remove the pot from heat, drain all the water carefully, then return to the burner and gently agitate the spuds until they dry out. Remove the pot from heat, and with a potato masher, process the spuds evenly, working around the pot until everything is evenly mashed. Add butter and use a flat whisk to incorporate. Add cream a little bit at a time and whisk in thoroughly, until you hit the consistently you like. Add salt and pepper, whisk to incorporate, taste test, and adjust seasoning as needed. When they’re done right, the shouldn’t need anything else, except maybe gravy, of course. Russet Potatoes, 1/2 to 1 each depending on size and appetites; the rest of these ingredient amounts are based on a 4 large potato bake, so scale accordingly. Rinse your spuds and pat dry with a clean towel. Coat whole spuds with avocado oil by hand, place in a glass baking dish. Season the skins evenly with salt and pepper. Slide the spuds into the oven and bake for about an hour, until the spuds are fork tender. Fry bacon, dry on paper towels and fine dice. Rinse, strip roots from green onions, and fine dice. When the spuds are ready, pull them out of the oven and let them cool just long enough to handle with a clean towel, (in other words, still quite hot). Cut the spuds into lengthwise halves, then carefully scoop the guts into a mixing bowl, keeping the skins intact. Add cream, sour cream, half the cheese, bacon, onions, and butter to spuds and blend thoroughly. Add salt, pepper, and Tabasco to taste. Refill the skins with the spud mixture, top with the remaining cheese, then slide them back into the oven; bake for an additional 15 to 20 minutes. Of course, stuffing is also a must. Try this recipe, redolent of herbs and citrus. It’s actually desirable to use bread that’s a couple days old, so buy ahead. Stuffing can be prepared a day ahead of service and chilled, covered. Bring the stuffing back up to room temperature before you bake. Cut bread into roughly 1/2″ cubes. Spread cubes on 2 baking sheets and bake until dry, about 15 minutes. Allow bread to cool on pans, then transfer to a large bowl. Crumble by hand and add the lemon thyme, savory, salt, and grains of paradise. Rinse and dice onion and celery. Zest and juice lemon. Lightly beat eggs. In a large saucepan over medium high heat, fry the bacon until crisp. Set that aside on paper towels to drain, and reduce heat to medium low. Add the butter to the bacon fat and melt thoroughly. Add onions and sauté, stirring steadily, until onions start to turn translucent, about 5 minutes. Add celery and continue to sauté, stirring occasionally, for another 5 minutes. Transfer all to the mixing bowl. Crumble the bacon, then add it plus the eggs, stock, lemon juice and zest to the bowl and combine thoroughly. Transfer stuffing to a lightly buttered, shallow baking dish, cover the dish with metal foil. Bake, on a middle rack for 30 minutes; remove foil and continue baking until browned, about another 30 minutes. Allow to rest for 10 minutes prior to serving nice and hot. And then there’s more veggies, ‘Cause, well, ya gotta. To me, green beans are the perfect choice, and you can usually find decent ones even at this time of year. Make sure you gets good ones at the store – If they don’t snap crisply when bent, they’re not the ones for you. Rinse and trim ends from Beans. Trim and peel Shallot. Mince 1/4 Cup and set aside. Beans can be steamed or boiled. To me, steaming gives better flavor, fresher, if you will. Prepare an ice water bath in mixing bowl. Cook Beans for about 3 minutes, then remove from heat and plunge into the ice water bath. When you’re about ready to serve, heat a sauté pan over medium heat, then add 1 Tablespoon butter. Sauté shallots until they begin to turn translucent, about 2-3 minutes. Add beans to pan, with the rest of the butter, toss to melt butter and evenly coat beans. Allow beans to heat through and cook for 2-3 minutes until they’re firm but tender. Remove pan from heat, then add lemon zest and juice from 1/2 lemon, and toss to incorporate. Season with salt and pepper, taste test, adjust lemon, salt, and pepper as desired. Brussels sprouts, the red headed first cousin of cabbage, get bad press far more often than they should. They’re truly a lovely vegetable and a perfect side for the big feast. It’s a safe bet that overcooking and poor seasoning have far more to do with negative reviews than the veggie itself. Brussels sprouts contain glucosinolates, compounds that offer abundant health benefits, but have the unfortunate tendency to release sulfurous byproducts when they’re overcooked. Avoiding the all too common boiling of sprouts is your first line of defense against bad taste. Here’s a preparation with bright and earthy notes guaranteed to please. Brussels Sprouts, about 6 per person; the ingredient measures here are scaled for 35 to 40 sprouts. Remove sprouts from stem and soak in cold water for 10 minutes. Inspect and trim any browned or yellowed leaves, and trim stems to about 1/4″. If your sprouts are large, you may halve them if you wish. Place trimmed sprouts in a mixing bowl, and coat generously with olive oil. Add garlic and toss to incorporate. Add enough salt and pepper to lightly coat. Roast sprouts in a middle rack for 35 to 40 minutes, turning once, until they’ve begun to brown. While the sprouts are roasting, prepare the almonds and cider reduction. In a sauté pan over medium heat, add the almonds and a tablespoon of unsalted butter. Sauté, stirring regularly, until the nuts and butter start to brown, about 5 minutes. Remove from heat and set aside. In a sauté pan over medium heat, add the cider and bring to a simmer. Whisking steadily, simmer until the cider has reduced by roughly 50%. Add a tablespoon of butter and a very small pinch of sea salt. Whisk to incorporate, then remove from heat and set aside. Combine all ingredients in a small bowl and whisk briskly to incorporate. Allow the dressing to sit while the sprouts roast. When the sprouts are done, allow them to cool for about 5 minutes. Combine sprouts, almonds, and reduction; toss to thoroughly coat the sprouts, serve warm. If you love cranberries, or even if you don’t, try this citrus infused sauce for a refreshing change. I’ve been making it for decades, and it’s still requested. Juice lemon and lime. Peel orange thoroughly and rough chop the meat from that; set aside. Bring water to a boil in a saucepan over medium high heat. When water is boiling, add cranberries and return to a boil. Reduce heat to medium and add citrus zest, orange, and juice. Allow sauce to continue to boil, stirring occasionally until about 3/4 of the cranberries have popped. Add cinnamon, nut get and salt, stir in thoroughly. Remove from heat and transfer to a glass or ceramic bowl. Cover and refrigerate until serving time. Will last in the fridge for about a week. And finally, in addition to whatever pies you dig, try this pumpkin flan for a very cool twist on the gourd of the day. You’ll need an 8” round cake pan for this, and it can’t be a springform. Alternatively, if you’ve got enough of ‘em, you can do this as individual servings in ramekins, but you’ll need to have your mis together to make sure you can get the caramel poured into them all and spread evenly. If you go the ramekin route, having them sitting in a bath of hot water will help a bunch toward that end. Preheat the oven to 350° F and set a rack in the middle position. Have your pan or ramekins ready to go, as noted above. Zest the orange, taking care to only get the colored part, leaving the white pith intact. In a heavy sauce pan over medium high heat, add the sugar, syrup, and 1/3 cup of very hot water. Stir to incorporate well. When the mixture begins to boil, reduce the heat to maintain a bare simmer. Allow the mix to cook, without stirring, until it’s golden brown and reading 230°F on a candy or instant read thermometer. Don’t leave the pan while this is cooking – It can go overboard quickly, so keep a sharp eye on things throughout the cooking process. As soon as the caramel is done, pour it carefully into the cake pan or ramekins. Be careful, it’s molten sugar and will burn the snot out of you if you’re careless. In a large mixing bowl, combine the two milks, the pumpkin, and the ricotta. Using a hand or stick mixer with a whisk attachment, beat the ingredients at low speed until the mix is smooth and uniform. Add all other ingredients, and whisk on low to fully incorporate. Make sure that your caramel is nice and hard, then use a spatula to transfer the batter from bowl to pan or ramekins. Place the cake pan or ramekins inside a roasting pan, and carefully fill that with water until water level reaches roughly half way up your pan or ramekins. Bake for 60 to 70 minutes, until the flan has set, but still has some jiggle to the middle when you gently wiggle the roasting pan. A tooth pick inserted into the flan should come out clean. Remove flan from oven, and from the roasting pan, and transfer to a cooling rack. Allow the flan to cool completely to room temperature, then cover the pan or ramekins tightly with plastic wrap and refrigerate for at least 4 hours prior to serving. When you’re ready to serve, run a knife around the edge of the pan or ramekins, and place a serving plate tight to whatever you’re transferring. Quickly but gently give the pan a flip and viola – You’ve got gorgeous pumpkin flan with a maple caramel ready to rock. You can add whipped cream, if you like, but you won’t really need it. Truth or dare time – How many of y’all, when it comes to your Thanksgiving turkey, do not show the bird the proper love? Tell the truth, now… Do you simply throw a bird in to the oven? Do you fill it with stuffing? Thought so… truth be told, even if you rub it with something nice, you’re still not giving that poultry it’s holiday due. If you want to serve the best bird, you’ve got to brine that turkey. I’m gonna tell you how, but first, here’s why. Turkey is an extremely lean protein. If you doubt that, buy some ground turkey, do nothing to it but cook it, and see what you get – unlike good, fresh hamburger, there’ll be no moisture in the pan, and the taste will be, well… less than optimal. Let’s face it, we don’t need fat from our bird, ‘cause we’re gonna get that from all the sides we make. What we do need is a tender, juicy bird, and again, brining is the way to get there. Now, I know there are some of you out there thinking, ‘yeah, but if I cook it right and season the skin nicely before hand, it’ll still be great,’ right? Well, no, no it won’t – it might be good, maybe even really good, but it won’t be great. Seasoning right before you cook, or even an hour or two before you cook, doesn’t allow the salt you’ve added enough time to do its thing. It won’t penetrate the flesh at all, really, especially with a hunk of meat as thick as a turkey breast. It’ll do a bit of work on the surface, but no more. Truly, the only way to allow seasoning to work is to give it the time it needs – And that means you need to brine that bird. Traditionally, brining is a wet process. We submerge the bird completely in a brine, and give it anywhere from eight to twelve hours to do its thing. That works great, frankly, and it really isn’t hard. Brined birds weigh more after cooking than a dry bird does – Up to 8% more, and that’s virtually all added moisture, which is very good indeed. The wet brine process also acts chemically to break down some of the tougher proteins within the bird’s muscle fibers, leading to tender flesh – Also good. So, if you’re of a mind to wet brine, here are some basics. Proper brining is a function of both brine strength, the weight of the bird, and brining time. What you’re doing at home is technically called gradient brining – That is, putting food in a higher salt concentration brine than you really want in the food, because you don’t have the time to do what’s known as equilibrium brining – That’s when you use a lower salt concentration and allow the time needed for the salt content in the brine and the food to equalize. When you see or read about something like pastrami being brined for a week or longer, that’s what they’re doing, and that’s also why the Pro’s make stuff that consistently tastes better than what we do at home. All that said, don’t fret – What we do at home is safe, and it really does make a better bird. So, for reasonable gradient brining, we brine whole turkeys for about an hour per pound, in a 5% to 6% brine concentration. Basic brine ratio is often shown as ‘1 cup salt to 1 gallon of water’, but not all salt weighs the same – what we really want is about 7 ounces of salt per gallon. When you brine, use kosher salt – The larger crystal size means it dissolves faster in water than fine grained stuff, and there’s nothing in there but pure salt, so it wont taint your brine. If you don’t have a kitchen scale, (And frankly, you should), then Morton Kosher weighs 7.5 ounces per cup, and Diamond 5 per cup. For the record, there’s nothing wrong with adding herbs or spices to a brine – If you like it, do it. For a 15 to 18 pound turkey, you will need a couple of gallons of cider or water, and a clean, food grade 5 gallon plastic bucket. You don’t need to heat the water or cider. Just make sure all the salt has completely dissolved before you proceed. You need to plan ahead for wet brining. You’ll want an additional 6 to 12 hours between the brining and the cooking, so, if you’re thawing and brining, your process needs to begin nice and early on the day before turkey day. Pay attention to food safety procedures during brining, without fail! Your brine and bird must remain under 40° F at all times, period; if you need to add a little ice, do so. If you need to add a lot, compensate with a bit more salt. When your brining period is done, pour out the brine, (NEVER reuse it.) Gently rinse the bird in clean, cold water, then pat it dry with clean paper towels and then transfer to a roasting pan. Now comes the secret to gloriously golden, crispy skin. Allow an air rest for your bird, by letting it sit, uncovered in the refrigerator, for 4 to 6 hours after brining. This will help moisture evaporate from the skin, and allow the meat to reabsorb some moisture as well. Now, if all that makes you paraphrase George H. W. Bush, ‘Not gonna do it, not gonna go there,’ then here’s an even easier option that works just as well. And it’s funny that, right at this point, literally right at this point in today’s narrative, I got this text from my friend John Joyce, a fine guitar maker from the Twin Cities in Minnesota – ‘Hey E what do you think: dry brined or wet brined turkey. I’ve done wet for years but I’ve read a lot of good stuff on dry brining.’ Yep, dry brining is exactly what I was about to type, so, here ya go JJ. While the term ‘dry brining’ might seem kinda oxymoronic, i assure you it’s not. In restaurants, this has been done for a long, long time. Often called ‘pre-salting,’ it acts on a protein more or less as a wet brine does, albeit without the water, equipment, or hassle. Think of it as a dry rub, like we use on poultry, ribs, and the like, and it’ll come to light for you. The chemistry here is very cool, too. When we first apply a dry brine, osmosis occurs, meaning the moisture within the bird is drawn toward the higher salt concentration rubbed on the skin. As that moisture reaches the surface, it dissolves the salt and sugar in the brine. In the final stages, the liquified brine is draw back into the bird as things equalize. There, the solution acts as a wet brine does, breaking down those tough muscle proteins and acting as a tenderizer – Pretty cool, huh? And to top it off, all this is done in your fridge, during a simultaneous cold rest, so you get that crispy skin, too – Two birds with one rock, if you will. Dry brining does require time, and in fact, more time than wet, usually. Since there’s no added water, you’ll need two to three days to let the process do it’s thing, so once again, plan ahead. It’s also important not to get a bird that’s been pre-seasoned in any way, since that can and will upset the balance of things – Avoid anything that says kosher, re-seasoned, or self-basting. You’ll also want a fresh bird, or at the very least a fully thawed one. Prep your bird by removing any of the extraneous bits, then pat it dry with clean paper towels. Gently gently separate skin from flesh over the breast area, taking care not to rip the skin. It’ll work much better in direct contact with the meat. Rub a teaspoon or two of the mix into the bird’s cavity, then do the same all around the drumsticks. Rub 3-4 tablespoons of the mix onto the breast meat, and use the rest evenly across the skin. Ct a small slit in each side of the bird about half way along the wing tips and then slide the tips into that cut. Put the bird on a roasting pan or rimmed baking sheet, and into the fridge for at least 2 days, and 3 is better. When the time’s up, you’re ready to cook. You can roast, deep fry, whatever floats your boat. Keep your bread stuffing in a casserole dish, and prepare a nice juicy cavity filler for the bird. Rough chop the orange, onion, and celery, (and if you have celery leaves, use those!). Throw those in a mixing bowl, then add oil, Sage, salt and pepper, then combine thoroughly. Stuff your bird’s cavity thoroughly. Place the bird on a rack in a roasting pan, and add 2 cups of clean water to the pan. Insert an internal thermometer to the thickest part of the breast. Standard roasting times, stuffed, at 350° F follow; that said, the only real way to know when the bird is done is by internal temperature, and we’re looking for 165 F.
Start your roast with the bird uncovered, then cover loosely with foil for the last hour. Basting isn’t necessary, but it sure doesn’t hurt. When the bird is done, remove it from the oven and let it rest for 15 minutes prior to carving – That rest is vital to allowing juices to equalize throughout the cooked bird, so don’t cheat! I told him I was honored and pleased by that to no end, and I truly am. Posted on November 14, 2017 November 14, 2017 Author urbanmoniqueCategories Basics & Process, Classics & Standards, House Made, Main Courses & MealsTags brined turkey, brining, brining chemistry, dry brine, poultry, thanksgiving, turkey, Wet brine2 Comments on Brine That Turkey!